Horse owners – it’s your last chance to take part in the Equine Grass Sickness vaccine trial! EGS is a devastating disease affecting grazing horses, ponies and donkeys and it’s almost always fatal. 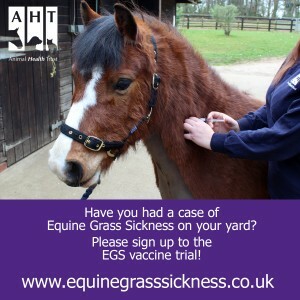 There is currently no known method of preventing it from striking, but the Animal Health Trust, together with the Universities of Edinburgh, Liverpool and Surrey, have been conducting a trial to see whether vaccination can effectively reduce the risk of EGS. We’ve been inviting horse owners to take part in the trial and provide an invaluable contribution to EGS research. To be eligible to take part, owners need to be keeping their horses on premises that have had at least one case of EGS in the past three years and all horses or ponies need to have a valid passport. At the end of August 2015, the Animal Health Trust is stopping enrolling new premises onto the EGS vaccine trial. If you or anybody you know has recently experienced EGS on your yard, don’t miss out on this opportunity to further our understanding of this dreadful disease.